Gavin Bland(Borrowdale FR) and Helen Fines (Calder Valley FR) were the winners of the opening race of the British Championship at Silent Valley in the Mournes. Top runners from across Britain and Ireland were competing in the 10 mile event which climbed 3 peaks in a circuit from Silent Valley. 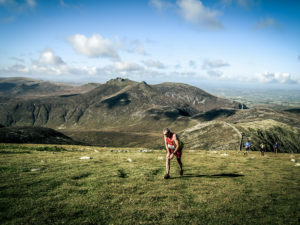 Bland, from the famous Bland fell running dynasty in the Lake District, was in the lead as he charged off Slieve Binnian. The 41 year old former flomax buy online British Champion was back in top form as he crossed Ben Crom Dam, with 3 times Ben Nevis race winner Finlay Wild (Lochaber AC), Karl Grey (Calder Valley FR) and double British Champion Rob Jebb (Bingley Harriers) chasing hard. Helen Fines was going really strong at Ben Crom and was well up among the men with a good lead over her challengers. Bland and Wild had a close battle around the second part of the course climbing Doan and Slievenaglogh. The Lake District Shepherd held his advantage, sprinting over the line to take the honours 1-43-00 and signaled his return to the very top competitive level. Wild chased him right to the line and finished 8 seconds adrift with Robb Jebb a gallant third in 1-43-51. Gray took fourth 10 seconds behind, with former British over 40 champion Lloyd Taggart (Dark Peak FR) and 2011 British Champion Morgan Donnelly (Borrowdale FR) completing the top six. NI champion Stephen Cunningham (Mourne Runners) was up among the top runners in an excellent 10th place, Jonny Steede (Ballymena Runners) also having a great run to finish just 2 places behind in 12th, with Deon Mc Neilly (Newcastle AC), now in the over 50 category, third local, well up the field in 35th overall. Helen Finnes ran out an impressive winner in the women’s race clocking 2-01-14 as Jasmin Paris (Carnethy HR) ran strongly over the second half to finish just 35 seconds behind. With Charlotte Morgan third and Helen Banner 4th the Carnethy club dominating the womans team race, as Shona Robertson (Shettleston Harriers) 5th ahead of British championship Lauren Jerka ( T Harriers). Dianne Wilson (Dromore AC) was top local in 21st one place ahead of Shilleen O’Kane (Lagan Valley AC) with Violet Linton (LVO) next in 26th. Borrowdale FR were winners of the mens team competition with Calder Vslley top over 40 mens team.